Patio covers are structures that are open-air, while providing protection from direct sunlight. They are a great option if your outdoor space is flooded with sunlight in the hottest part of the day. Why not build a patio cover plan and enjoy your outdoor living area for many hours longer in the heat of the day? 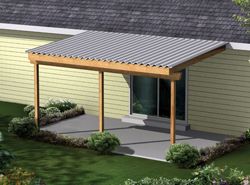 Our collection of patio cover plans includes many styles and sizes perfect for making your backyard area more enjoyable. We offer detailed blueprints that allow you to envision the end result. With a wide variety of plans, we are sure that you will find the perfect do-it-yourself project to fit your needs and style.